DESCRIPTION You can't have grandkids without an easel! DETAILS You can't have grandkids without an easel! 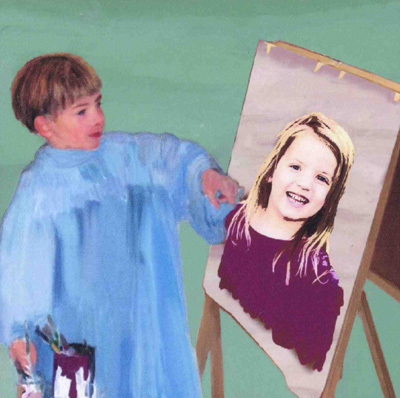 My grandchildren were painting at their easel by the time they were two and a half. Toys R Us has reasonably priced easels. Water color paints (like they use in kindergarten) and brushes can be bought at a crafts store. Here in Northern California that would be Michael's. I bought a big roll of brown paper which I cut to size and tape to their easel with masking tape. They wear Granddads old shirts with the sleeves cut shorter and after we ruined a pair of shoes, plastic bags on their feet. When they were smaller, they chose three colors to work with, too many colors end up looking like mud. Our easel has two sides, one for each grandchild. On each side I put a small table which holds water, a rag, their choice of paints in paper cups and brushes. No grandchild wants leave our house until they have painted a picture. We get to keep some of them and have a special place where we display them.